standing by the boulder in the bottom center of the photo. This spectacular shelter arch is located in Escalante Canyon at its junction with Stevens Canyon, just upstream from Coyote Gulch, in Grand Staircase-Escalante National Monument. At first glance, it appears that there is no way to get up to this arch, but it is actually not difficult or even scary to hike up inside it. It can even be done as a day hike (details and video below). The hike is truly spectacular and well worth the effort. This arch was measured by the National Geographic Society in 1954. A report on the trip was published in "Escalante: Utah's River of Arches," National Geographic, September, 1955. They measured the maximum light opening at 225 feet, but this measurement was done at an angle to the horizontal plane, which does not correspond with the NABS standard definition of the span of an arch. The span according to the NABS proposed standard can be calculated to be 220 feet. 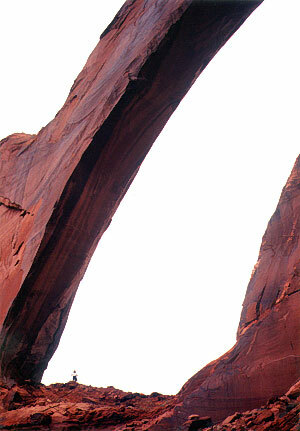 The two easiest ways to reach this arch are as a day hike from Fortymile Ridge, or as a backpack down Coyote Gulch. Coyote Gulch is of great beauty and is one of the premier backpacking destinations in the country. It contains three other spectacular natural arches (one of which is a natural bridge). Guidebooks to this area inlcude Hiking the Escalante by Rudi Lambrechtse, Hiking Grand Staircase - Escalante & the Glen Canyon Region by Ron Adkison, Trail Guide to Grand Staircase Escalante National Monument by David Urmann, and Canyon Hiking Guide to the Colorado Plateau by Michael Kelsey. None of these books give the complete route description up into the arch as provided below, however. 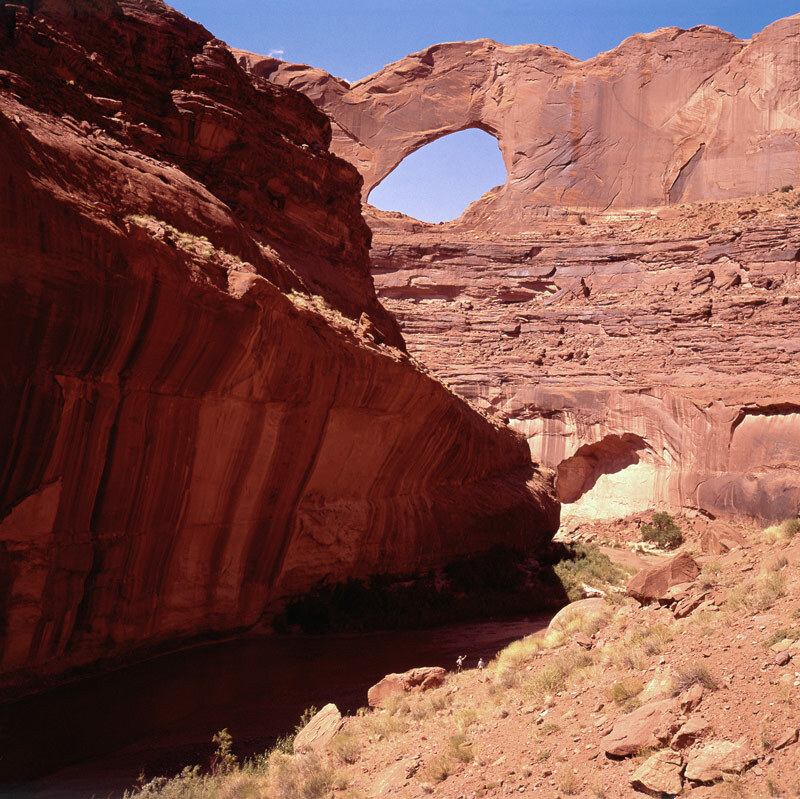 There are many other large and beautiful natural arches in the Escalante area. Jacob Hamlin Arch in Coyote Gulch and Broken Bow Arch in Willow Gulch are two of the more spectacular. At mile 35.7 on the Hole-in-the-Rock Road (the name does not refer to an arch), turn left (NE) onto the Fortymile Ridge road at a signed junction. Drive about seven miles to a parking area at the end of the road. The last two miles are very sandy with a high center so high-clearance 4WD is recommended. It is possible to make it with a 2WD car with reasonable clearance. The trick is to keep moving (don't slow down or stop), but this is unnerving because of the high center. It is both boring and tedious to hike this sandy road. The hike from the parking area to the inside of the arch is about 8 miles round trip with a total elevation gain of about 1500 feet. It takes an average hiker about seven hours round trip. Go down the sand hill to the left of a huge rock I call Escargo Rock (because it looks like a giant snail) and down into Coyote Gulch. Turn right at Coyote Gulch and head downstream. There is a section here which is a bit exposed and requires caution. Watch out for sand on the rock, since you definitely do not want to slip here. You then reach a log to help you get down to the stream bed. If the log is no longer there, you can hunt around for another route. It is also possible to avoid this exposed section by carefully making your way through a boulder pile/waterfall in the creek bed. This is easier for some but not for everyone. At this point you can take off your boots and walk barefoot in the sandy stream bed. It's only a short distance along this extremely beautiful and pristine canyon to the Escalante River. << A member of The Natural Arch and Bridge Society stands inside Stevens Arch. Photo by David Brandt-Erichsen, NABS. Before you cross the river you should scout the route up the talus slope on the other side, on the east wall of Escalante Canyon almost immediately upstream across from the mouth of Coyote Gulch. There is only one area where the cliff is sufficiently broken with loose talus, and there are one or more beaten paths going up. As you near the bench above, work your way to the right a bit to overcome the last rock obstacles. Once on the bench, it is practically like walking on a freeway along the bench and into the arch. This whole hike is a glorious experience (except perhaps for the trudge back up the sand hill). See this arch in 3D - four stereo pictures illustrating the hike.